How many grand pianos can you squeeze into a five-room house? For 25 years this was not a trick question for Edmund Michael Frederick, a former East Asian history major and current harpsichord builder and amateur performer, and Patricia Humphrey Frederick, an elementary music-ed specialist, organist, and choir director. 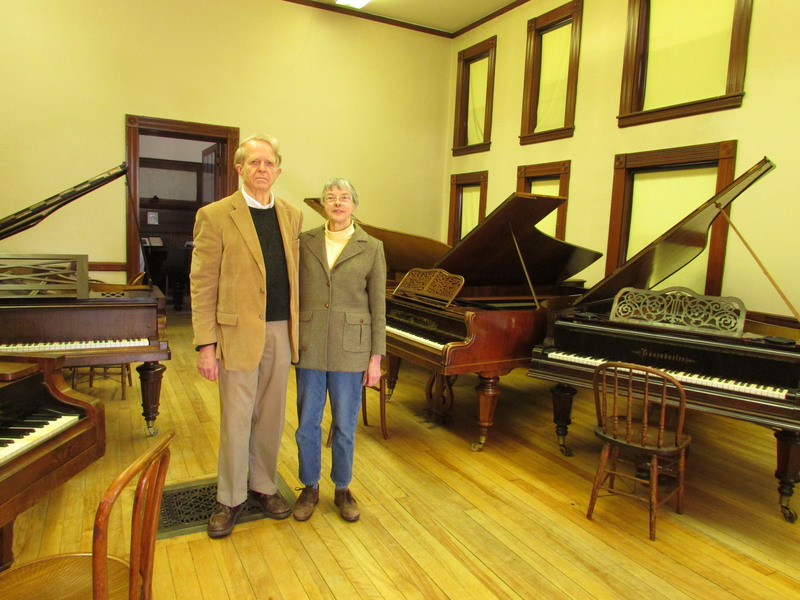 In 1976, the couple purchased the first of what now amounts to over 35 historic pianos, an 1830 Stodart built in London that cost just over $2,000 (plus $1,000 for air freight). Today their collection includes 24 restored pianos, ranging in age from a Viennese instrument built about 1795 to a 1928 Erard from Paris. Another 12 pianos are in various stages of restoration. The husband and wife team bring complementary talents to their nonprofit enterprise, which gives student and professional musicians a chance to hear and play piano works as originally conceived by their composers. Edmund researches the history of the piano in the context of its repertory and performance practice, restores the instruments, and serves as a consultant and lecturer on historic pianos. Patricia, whose father curated the Casadesus Collection of Ancient Instruments at Boston’s Symphony Hall, is the business manager, publicist, fundraiser, and assistant lecturer. Neither receives any salary, and, in Frederick’s words, they “beg energetically" to cobble together a shoe-string annual budget of $40,000. From the outset, the Fredericks have been intent on making the instruments performance-accessible, not museum pieces, and amateurs and luminaries alike play and occasionally record works ranging from Haydn and Beethoven to the French Impressionists. The Fredericks also present a 12-concert series in a nearby church (using a horse van to move the instruments back and forth). In 2000 they were finally able to transfer the instruments from their home into a restored 1890 brick ex-library in the center of Ashburnham in north-central Massachusetts. The Frederick Historic Piano Collection, as it is officially known, is open to the public (walk-in tours are available on Thursdays from 10:00 to 4:00 and Saturdays from 1:00 to 4:00) and is a frequent haunt for international artists such as Richard Goode and Gilbert Kalish, as well as conservatory professors and their students.